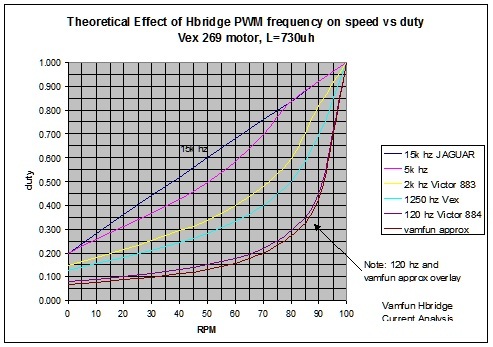 In 2009 I spent a lot of time in a First Chief Delphi forum thread with some motor experts figuring out why a JAGUAR controller was linear in speed with duty cycle and a Victor was non_linear. An example of this phenomenon is shown here for a Vex 269 motor being driven by several types of controllers. Data is from my Excel H_bridge model. All controllers have basically the same design except for the PWM frequency. The extremes are for the JAGUAR is 15k hz and the Victor 884 is 120 hz. Turns out that the motor time constant tau = L/R (motor inductance/motor resistance) relative to the PWM pulse period T is key to the phenomenon. I call the ratio of these lamda = T/(L/R). I developed some analytical models for this forum which can predict the waveforms and average currents with good accuracy for various types of controllers and I want to show the basic mathematical derivation in this post. I have updated the equations to include the Vex controller which has a PWM frequency near 1250 hz which is in between the JAGUAR and the Victor 884. 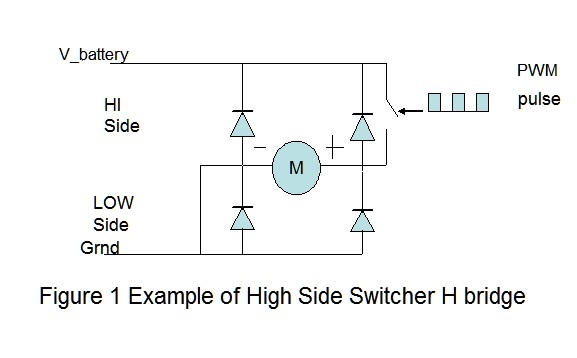 The type of H bridge that I am assuming is often called a high side switcher or asynchronous sign magnitude H bridge. 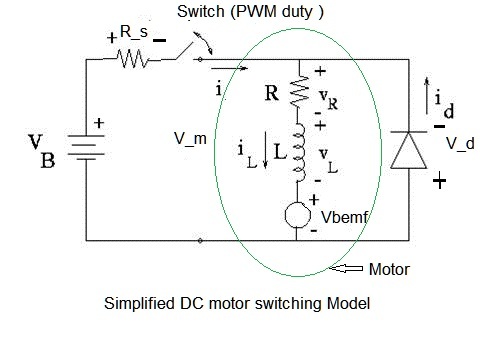 Basically, for a given motor direction, two switches are used while the others remain open. General note.. clicking on any figure will expand it to maximum size. 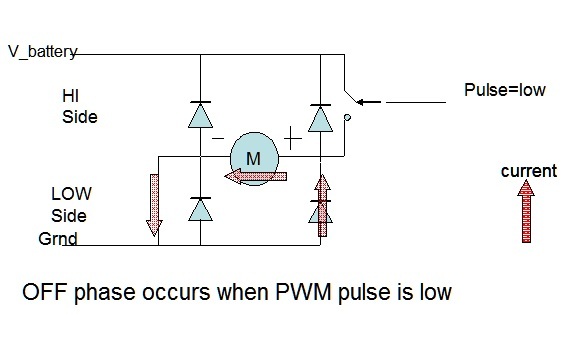 On the high side switcher, a lower switch is closed and the upper switch is driven by a PWM waveform and opens and closes with period T and duty cycle D.
When the PWM pulse is high, the ON current flows from the battery through the motor as shown. 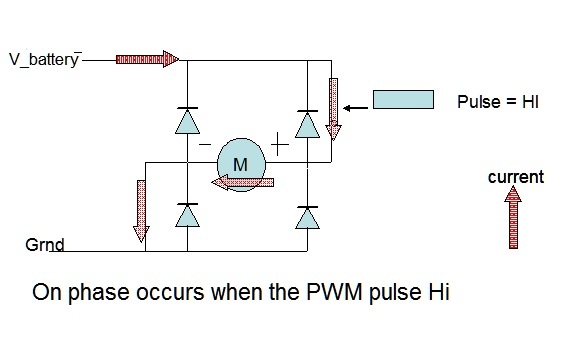 When the PWM pulse is low, the OFF phase current flows through the diode as shown. There is also a diode that is across the motor to allow current to flow when the switch is opened. The switch opens and closes with a PWM drive with duty cycle D and period T.
(click figure to expand)When the switch is closed current increases exponentially from its last value toward a steady state value of i_ss_on. When the switch is opened, current decays through the diode toward i_ss_off. If it reaches zero then current stops and remains at zero until the next on pulse. We can write the differential equations for these two phases. It is important to note that these equations are for the controller direction that puts a positive voltage across the motor. When the motor is commanded in the opposite direction some sign changes must be made to the equations. Where ever you see a V_b and a V_d simply change the signs and the equations will be correct for the current. The steady state speeds also require replacing i_free with -i_free. These will be added in the software implementation by using the sign(command) which tests the sign of the command. Duty is always positive and for Vex is defined as D = abs(command/127) where the command ranges between -127 and + 127. 0 = V_b – V_bemf – V_L – i*(R +R_s). di/dt = (i_ss_on – i)/tau_on where tau_on = L/(R_s + R) . where i_0 is the initial current. When the switch is opened current in the motor coil finds a path through the diode. i_ss_off = -(V_d + Vbemf)/R when di_L/dt –> o.
where again tau_off = L/R . Here i_max is the maximum current of the ON phase which occurs at the exact point that the switch opens or at t = D*T so i=max is the initial current for the OFF phase. t’ is the time from the switch opening. I. E. t’ = t – D*T for t> DT. The time constants for the ON and OFF phases are slightly different due to the addition of Rs during the switch ON phase. I.e. tau_on = L/(R+Rs) and tau_off = L/R. For the Vex motors, Rs << R so the following equations will use the approximation tau= L/R = tau_on =tau_ off. otherwise after a cycle is completed the next initial condition will be different from the initial condition for the last cycle. Recall as shown in this figure, the current can be continuous or discontinuous. In Case B, the current tries to reverse sign during the OFF phase but is clamped to zero by the diode for the remainder of the PWM period. So both the final and initial currents are zero in the steady state. With this constraint, we can solve the i_0 equation for D’ at the point where the waveform reaches 0. Similarly for the off phase we have the same form except i_o for the off phase = i_max. (i_ss_on – i_0)*(1 – exp(-lamda*D) = -(i_ss_off – i_max)*(1 – exp(-lamda*D’) = i_max – i_o. We can substitute for i_ss_on and i_ss_off and get i_avg in terms of voltages. For a given D , D’ can vary from 0 to 1 – D depending upon the value of D and lamda. The current waveforms take on essentially three shapes: rectangular, triangular or exponential saw tooth shapes depending on how D’ is characterized. XI Vamfun rectangular approximation lamda>>1 , D’= 0.
which says that if the current doesn’t exceed i_free then the drag torque holds the motor speed to zero. This curve was generated with a Labview program I wrote which is a simple integration of the L R response to various duty cycle inputs. This leads to a linear steady state speed vs duty when i_avg = i_free. I. E.
This equation becomes the standard DC motor current model when V_d = o . Notice that the first trace which is the motor voltage has three distinct levels. During the ON phase it equals V_b. During the off phase while the diode is conducting it equals -V_d and when the current goes to zero it then reads the back emf voltage V_bemf. During this period some controllers actually sample V_bemf to estimate motor speed without encoders. If the diode always conducts like the previous figure, then the controller must periodically use a special pulse to sample V_bemf. Ok, we have lots of formulas and here are the steps to put them to use. 2) Compute i_ss_on and i_ss_off from known voltages. 3) Compute i_0 and test if current is continuous or discontinuous. If the sign(i_0) is opposite the sign (i_ss_on). I.e. if( sign(i_0) *sign(i_ss_on) < 0 ) then current is discontinuous and set i_o = 0. Thats it. See link below for a RobotC implementation of these equations. This entry was posted on Saturday, July 21st, 2012 at 11:40 am and is filed under FRC, RobotC, Vex. You can follow any responses to this entry through the RSS 2.0 feed. You can leave a response, or trackback from your own site. Hello and thank you for this article, it’s not the first time I read it, I find it interesting and I thought I can try to understand it with every details. Do you have more details for how you arrive to those values for Area_ON and Area_OFF? Atleast the equation that you integrate exactly..
Actually, we need to integrate the equations of i_on and i_off. You got it! Glad to hear. I was just composing a reply. What is you interest in using these equations?